Celebrate Iris Day on May 8 to make the most of this gorgeous and unique flower. Sunnier days are ahead as we look forward to bringing out the brighter colors in our wardrobe and in our flowers, like the tulips at the beginning of spring to irises. A popular garden flower, irises are also prevalent art, culture, and seasonal flowering arrangements. Irises have been a floral icon for centuries, inspiring beautiful paintings, perfumes, and even its own day, Iris Day, which happens to be coming up. Iris Day falls on May 8 and is a day to celebrate this striking flower. 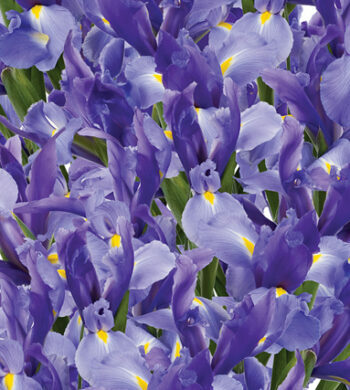 In honor of Iris Day, we’ve gathered a few of our favorite facts and iris bouquets to enjoy this fun occasion. The name, Iris, comes from the Greek word for the goddess of the rainbow, possibly referring to the diverse range of colors that irises are available. 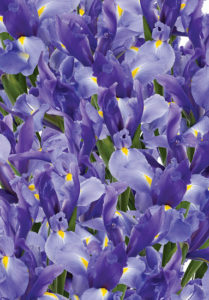 Named after a goddess, the iris flower has also been revered all over the world. In Japan, for example, irises were admired as a symbol of purity, cleansing and protection from any evil energies, which is why irises can often be found in kimono fabrics, woodblocks and more. 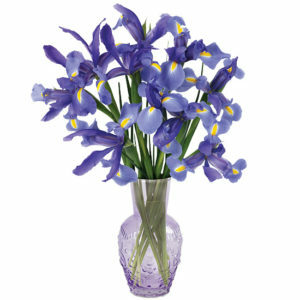 Irises’ distinct shape works well with taller flowers for an interesting, iris floral arrangement. This unique shape is not only useful for insects looking for nectar but is also part of why the iris is such a highly-prized flower. It stands up to other flowers easily while maintaining a special and striking look. 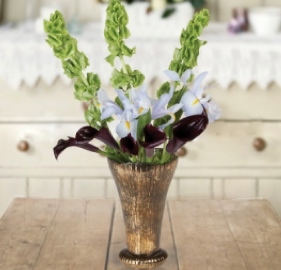 The distinct structure of the blossom works well in taller arrangements like our English Garden Escape bouquet which pairs light Telstar irises with dark purple calla lilies and Bells of Ireland for an iris flower arrangement that is a study in deep and dramatic contrasts. It is easy to see why purple irises, like these, have inspired centuries of fine art, emblems and cultural icons. Its sword-like shape and brilliant colors has spawned many different patterns and emblems across centuries. Emblems like the original Fleur de Lis were inspired by iris flowers to create decorative ornaments for royalty such as scepters and coats of arms. But perhaps the most recognizable form of irises in art comes from the ever-popular Dutch Masters. Famed Dutch artist, Vincent van Gogh, produced a series of paintings which included beautiful blue irises that were inspired by his time in France as well as Japanese woodblock prints of florals that were influencing many other European artists at the time. And with the rainbow of colors to choose from, irises provide us with plenty of choices when deciding on what sort of message to send. A blue or purple iris bouquet is reminiscent of the classic depictions of irises while a white iris can work as a blank canvas, highlighting the beauty of other flowers. Regardless of what your favorite may be, irises are the perfect springtime flower that is sure to influence us for centuries to come. We will certainly be excited to send irises and decorate with these beauties on May 8th for a fun surprise and to celebrate the impressive and inspiring iris flower!